Classy? Check. Luxurious? Check. Ridiculously expensive? Check. Alas, we can only but drool at these products but if you can get your hands on them, then by all means, go ahead. 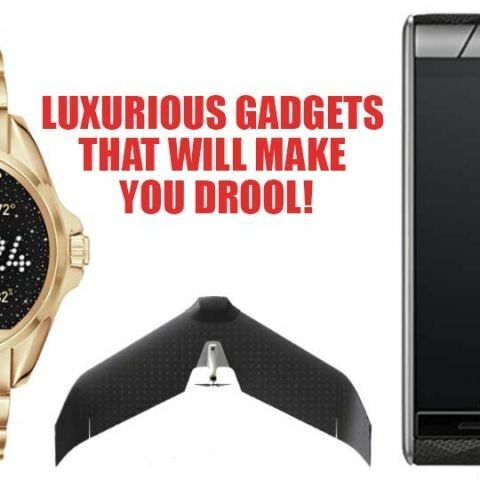 Let’s check out some truly drool-worthy products! Brands like Huawei, Asus, Sony, Samsung and more have introduced their own Android Wear based offerings in the market. 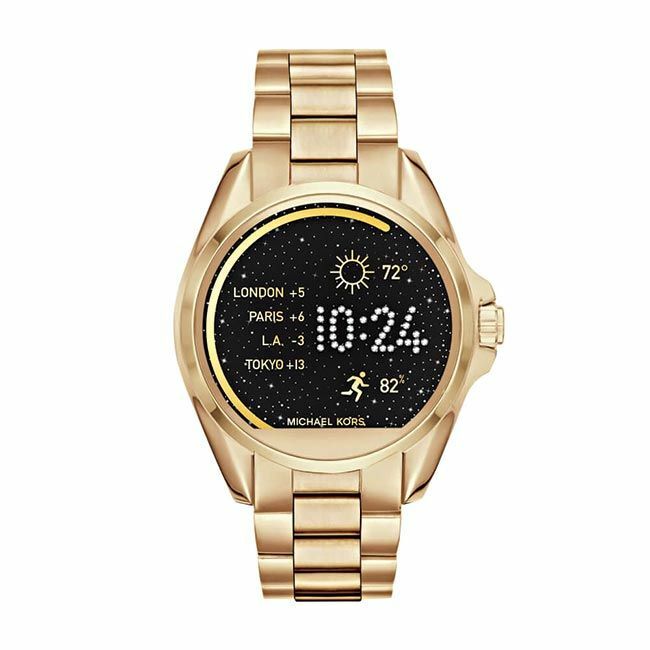 On those lines, the first smartwatch from a major designer is the Michael Kors Access range. The device offers an almost seamless connection with your phone; most updates received on your phone show up almost instantly on the watch. It also has WiFi so you don’t need your phone around to be connected for updates. When it comes to the size, the Bradshaw is thicker and heavier than your typical smartwatch. It has a host of features like 5 supported gestures, preloaded replies and music playback. If you’re ok with a trip to your local watchsmith to get the huge wrist band adjusted, this is a brilliant luxury smartwatch. Lehmann Aviation’s new L-A Series is made up of three fully automatic drones, each of which is targeted towards a specific application. The LA500 is a high-end drone designed mostly for professional use and the high-end consumer, the LA500-AG is meant for agricultural purposes and lastly, the LA500-RTK is meant for highly accurate mapping and DEM. Gmail has another outage; are you going to backup your inbox now? 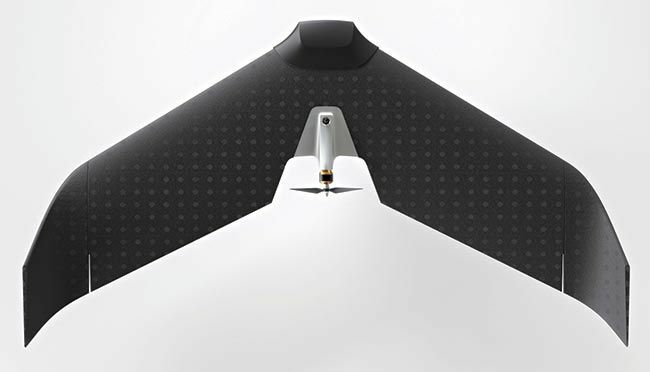 The drones are made of aluminum, carbon fibre and EPP foam. They’ve also got a new modular design along with more rugged and reliable systems, and a powerful new autopilot. Thanks to the modular design, owners can replace or upgrade any part of the drone as they see fit when the need arises. The Drones come with small detachable winglets that keep the weight as low as 1250g, and that’s including the camera, which is amazing. This also makes the L-A series drones much easier to transport thanks to their compactness. All of the aircraft / drones are controlled through the OperationCenter software for Windows 10. The new OperationCenter v2 software comes with lots of new features and an improved UI for more ease. These drones don’t come cheap though, the launch prices for the L-A drones starts at $3490(Rs.2,40,000/- approx) for the LA500 to $7990(Rs.5,45,000/- approx) for the LA500-AG. The UR-105 “Raging Gold”, as Felix Baumgartner, URWERK co-founder, explains, is the result of gold’s lure on him. The UR-105 Raging Gold features a shield of red gold on its titanium body. On top of that, the shield itself has a pattern carved into it which makes it a pleasure to touch as well. The pattern is derived from the hobnail motif “Clou de Paris.” URWERK watchmaking revolves around one particular concept, that of the wandering hour principle, where each hour travels across a 60 minute arc. This method makes telling the time easier, where a mask on the watch face hides the hours that have already finished their 60 minutes. 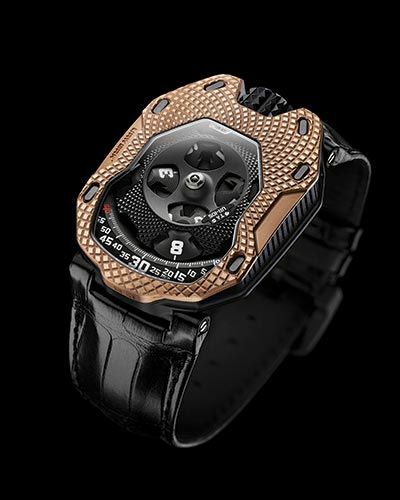 The UR-105 also makes use of this concept, in addition to the all latest developments at URWERK. The UR-105 utilizes the finest of craftsmanship and the feeling cannot truly be described, only felt with the watch itself in your hands. Isn’t that the case with all true craftsmanship? We’ve all pretended our pens were rocketships during our childhood. Classes could get pretty boring and all we had to entertain us was our imaginations. 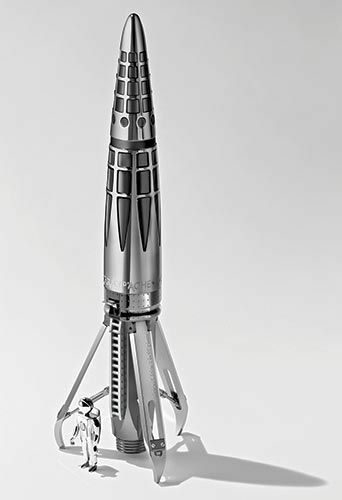 But we don’t really need to imagine a pen as a rocket anymore, because the Astrograph is not just a luxury pen, this mechanical pen IS a rocket pen, complete with a rocket-shaped fuselage, shock-absorbing landing gear and even a launch pad which doubles as a case. You’ve basically got a mini rocket and launch pad for your desk. The MB&F Astrograph has been in the making for four years, so you may have heard of this pen in the past, but after four years in the works, there’s no doubt that the Astrograph is one of the most complex writing instruments to ever grace us, period. The Astrograph comes with sand blasted, satin-finished, and rhodium-components. To add to that, it’s got a lever which controls the stabilizer legs, which once lowered makes it possible for you to stand the Astrograph up vertically. As a bonus, they’ve thrown in a miniature astronaut too! Vertu has been holding the flag for luxury smartphone manufacturing for several years now. This time, they have included a really powerful camera module never seen before in any other smartphone. Housing a 13-megapixel Hasselblad camera, you can expect really high quality pictures from this phone. The Aster is powered by a Snapdragon 801 CPU, which seems like a bad move considering they’re using an old generation CPU rather than the latest one. But then again, the 801 isn’t that bad and it can handle current apps pretty well. One of the premium features on this phone are the ringtones which are composed and performed by the London Symphony Orchestra. Other premium experiences, such as the concierge service are also available, which is present on every Vertu phone. Available in several colour options, the phone will set you back by a staggering Rs.2.8 lakh.